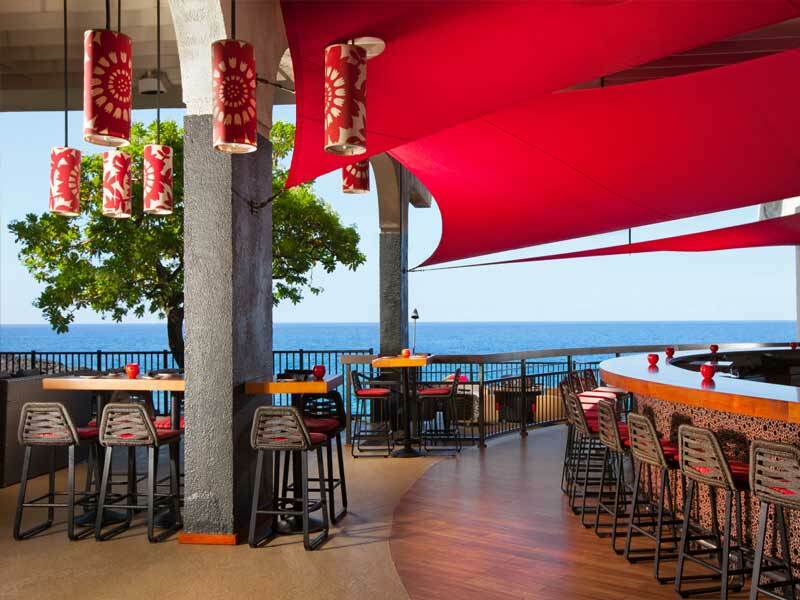 Experience the Hawaii of your wildest dreams at the Sheraton Kona Resort & Spa at Keauhou Bay. 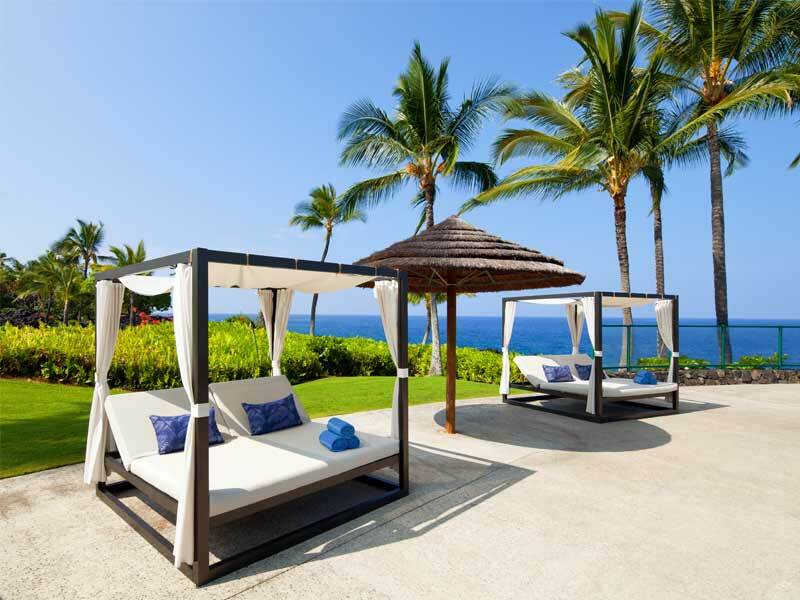 Set on the Big Island’s Kona Coast, this oceanfront resort offers ultimate luxury and nature at its best! Relax in tropical sunshine while gazing out across the startling blue ocean, feel dwarfed by the backdrop of the majestic Hualalai volcano and enjoy a host of marine activities in the surrounding vibrant reefs. 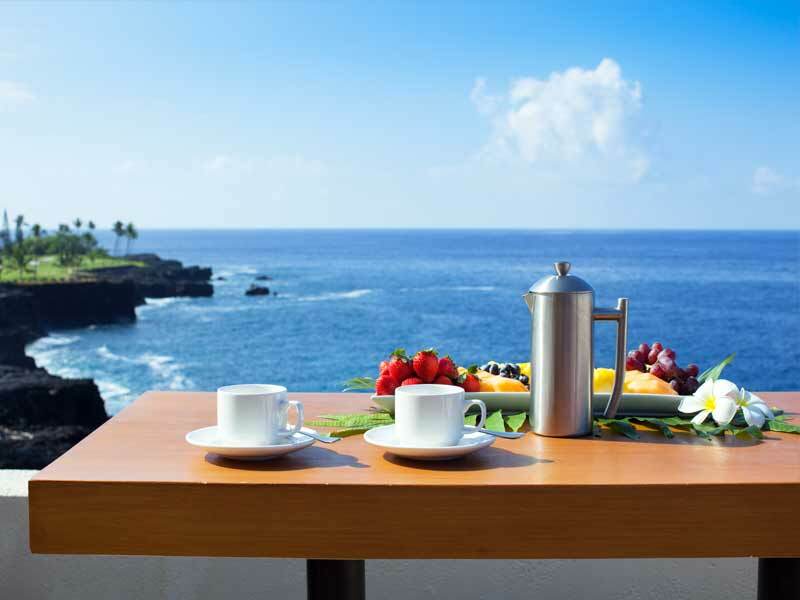 Sheraton Kona Resort & Spa Keauhou Bay is captivatingly picturesque. Whether you want to indulge, be pampered or learn about the Big Island’s colourful past, you can do it all from this impressive base! 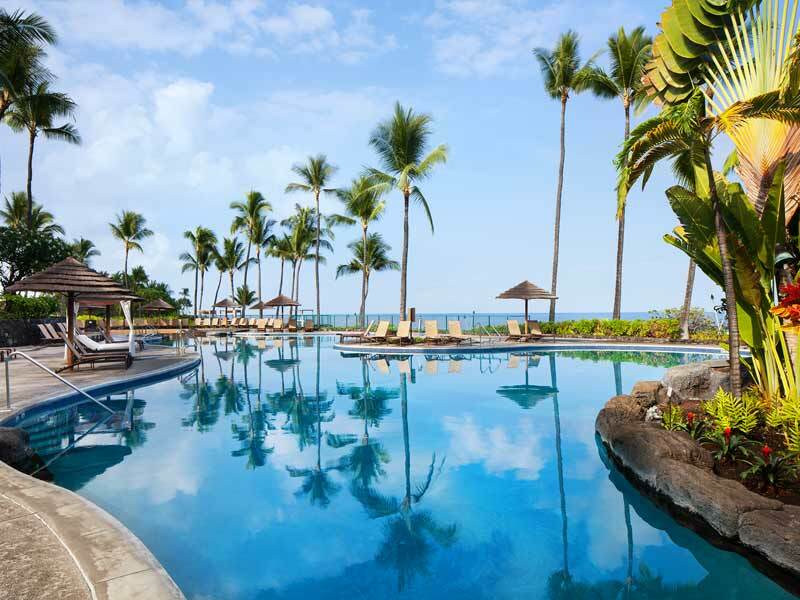 Treat yourself, here, to a Hawaiian holiday you will never forget! Spread out in spacious, well-appointed rooms and suites. Boasting private balconies and original fabrics and prints by Hawaiian designer, Sig Zane, all guestrooms at the Sheraton Kona Resort & Spa at Keauhou Bay will quickly wrap you up in the wonders of tropical bliss! Start your days slowly, embracing the comfort of your light-filled space. Take in views of the mountains or the ocean, relax in plush signature beds, then wander through landscaped gardens to enjoy the rest of this incredible resort! Choose from 4 dining venues to fuel your days, work on your tan by the expansive, multi-level pool, indulge at the Hoola Spa and fitness centre, play golf, shop, snorkel, dive and more! With cultural activities, family programs, couple’s packages and more, there’s something for every holiday maker at this stunning resort! 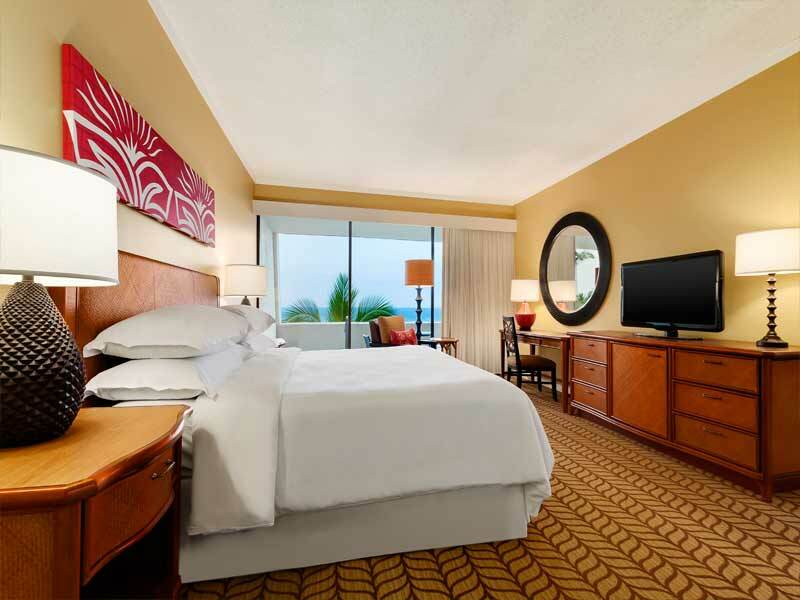 Why go to Sheraton Kona Resort & Spa at Keauhou Bay? The reasons to check-in to the Sheraton Kona Resort & Spa at Keauhou Bay are so many and varied, they will seem endless! From the warm Hawaiian welcome, to the captivating natural beauty that surrounds, your every minute here will be a treat the mind and the senses. Start at the expansive outdoor pool. Overlooking the Pacific Ocean and Keauhou Bay, this impressive multi-level pool is something to behold! Complete with a 70m lava tube waterslide, fountains, waterfalls and a kid’s area with a sandy beach zone, all ages will enjoy their time here. Bubble away in the whirlpools, enjoy a cocktail from Hula Poolside Bar & Grill, hire a cabana and work on that tan! Dry off and enjoy a spot of shopping. Wander the Farmers Market each Wednesday, marvel daily at the crafts by local artisans, purchase 100% Kona coffee, daily necessities and a range of unique souvenirs. Treat yourself to the tranquil oasis that is the Hoola Spa, maintain your fitness in the fully equipped Sheraton Fitness centre or head to the adjacent Kona Country Club to practice your swin at the driving range or play on one of two 18-hole courses! Marine lovers can treat themselves to one-of-a-kind manta ray experiences in the reefs surrounding the resort, there are diving trips, cultural activities, luaus, village tours and more! Start your days facing this ocean in these glorious, light-filled rooms. Enjoy 39sq. metres of space, your own private balcony, tasteful Hawaiian-designed decorations and stunning tropical views. Rest well on your choice of King or Twin bedding—sink into the Sheraton Signature mattresses and lose yourself in the luxury of crisp white sheets. These rooms feature a TV with cable and movie channels, free Wi-Fi, a coffee maker, air-conditioning and more. They can comfortably accommodate up to 2 adults and 2 children. Embrace the Pacific horizon in these well-appointed rooms. Boasting their own private balcony, floor to ceiling windows and plenty of natural light, you’ll be able to soak up the wonders of your surroundings from the moment you check in! Ocean View rooms have a coffee maker, mini-fridge, air-conditioning, free Wi-Fi, a flat screen TV with cable and movie channels plus a separate en-suite bathroom with full bath amenities. Sleep well on your choice of a King or 2 Twin Sheraton Signature beds and put your feet up on the ottoman when you sit in the in-room armchair. These rooms can accommodate up to 2 adults and 2 children. Treat yourself to uninterrupted horizon views and lose yourself in ultimate tropical bliss! Ocean Front Rooms boast 39sq. metres of space, private furnished balconies, air-conditioning, free Wi-Fi and more! They are beautifully light-filled, thanks to stunning floor-to-ceiling windows and feature a range of Hawaiian designed prints and fabrics! Sink easily into your choice of a King or 2 Twin Sheraton Signature beds, make use of the full range of bath amenities, watch a movie or cable TV from the comfort of your armchair and completely relax. 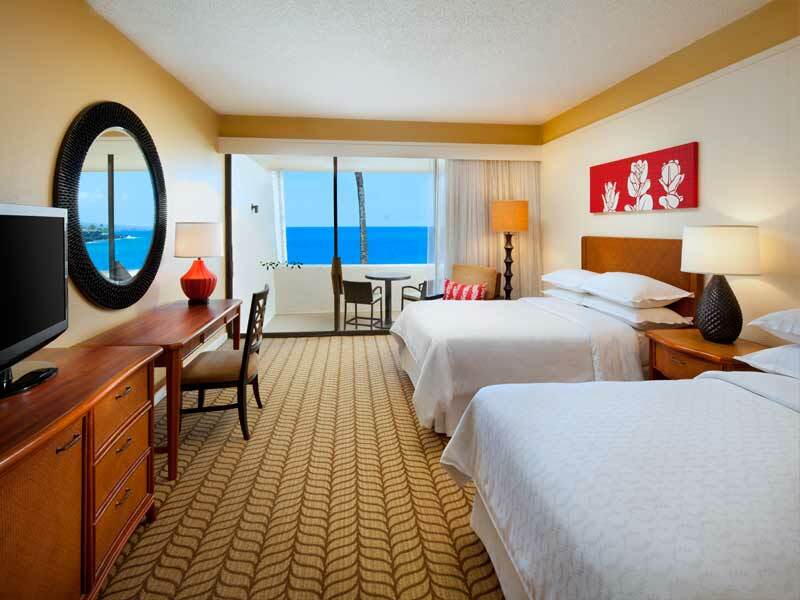 Ocean Front Rooms are perfect for water lovers and can accommodate up to 2 adults and 2 children. 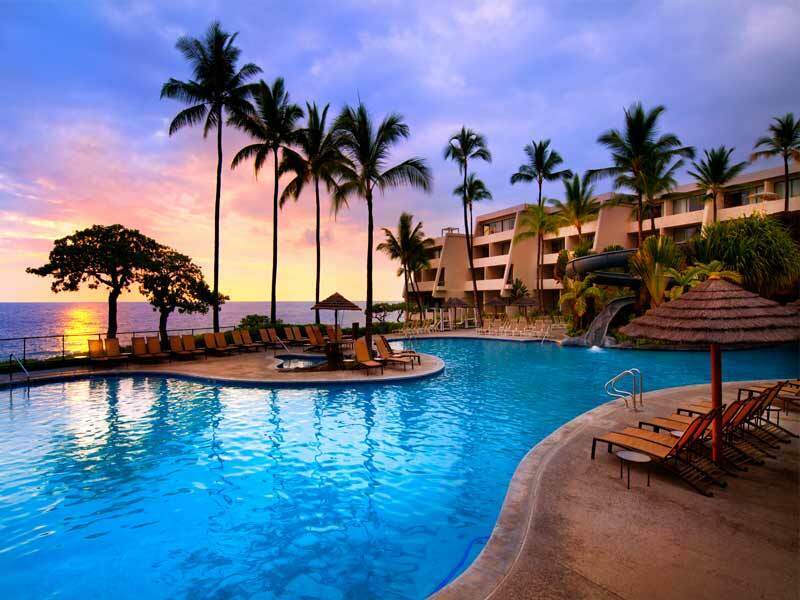 Sheraton Kona Resort & Spa at Keauhou Bay is located on Hawaii’s Big Island (the Island of Hawai’i). The resort is in a prime position on the Kona Coast. It looks out across the Pacific Ocean and Keauhou Bay and boast the impressive backdrop of the Hualalai volcano. 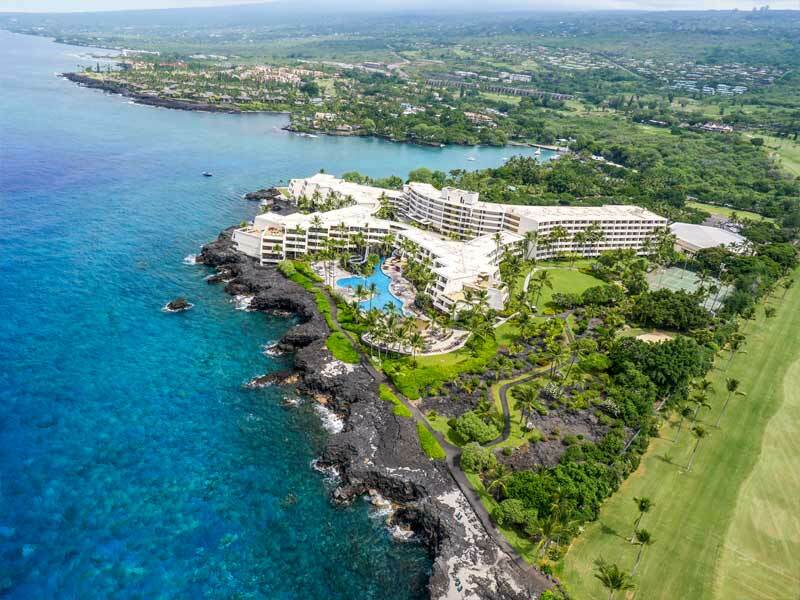 Reefs teeming with marine life lie just beyond the resort’s black lava outcrops, 22 acres of tropical garden surround and the Kona Airport is just under 25km away. 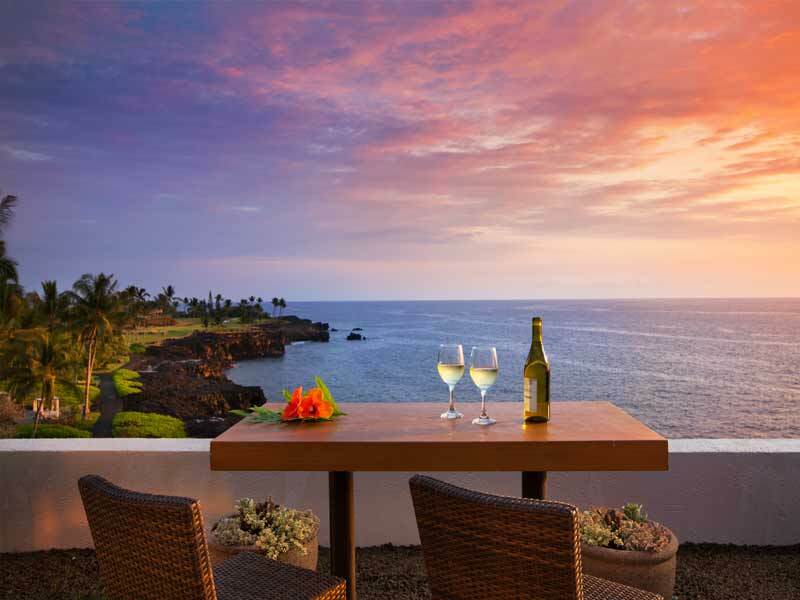 There are so many incredible experiences to be had while at Sheraton Kona Resort & Spa at Keauhou Bay. The resort is located on the largest, most geographically diverse island in Hawaii. The Big Island is home to deserts, rainforests, volcanoes, snow-capped mountains and reefs—guests can hike, zip line, snorkel, dive or fly; each holiday here will be completely unique depending on what each individual wants to do. One of the top attractions at Sheraton Kona Resort & Spa at Keauhou Bay is the See & Swim Manta Ray experience. Learn about the gentle giants at the Manta Learning Centre, view them at Pa’akai Point or swim with them in the bay, just off shore! Inside adventures abound too, with shopping tours and shuttles running regularly, plus the Kona Country Club, adjacent, will keep golf enthusiast more than entertained! Love this hotel. Open and airy with great facilities and large rooms. Great pool and beautiful gardens. The location was great and we enjoyed fantastic views!